Delta is ranked as one of the world’s “greenest airlines” by the environmental website Greenopia.com. 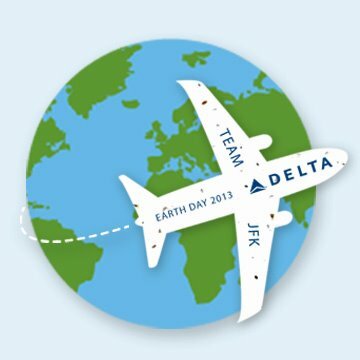 To celebrate Earth Day 2013, Delta Team JFK is giving away 11,000 plantable airplanes made of 100% recycled handmade paper that is embedded with wildflower seeds. Green Field Paper Company produced these die cut airplanes for Delta. The back of the airplanes are printed with planting instructions so that Delta passengers can transform their paper airplanes into beautiful wildflowers at home or wherever their final destination may be.